Reception Saturday, April 22, 5-8 pm. Though virtually forgotten until recently, nobody better represents the talent and originality in Bucks County painting in the 60s and 70s. Please join us for the opening reception. Kirsten Jensen, Chief Curator of the James A. Michener Art Museum, will present an introduction to the work of Ponstingl. 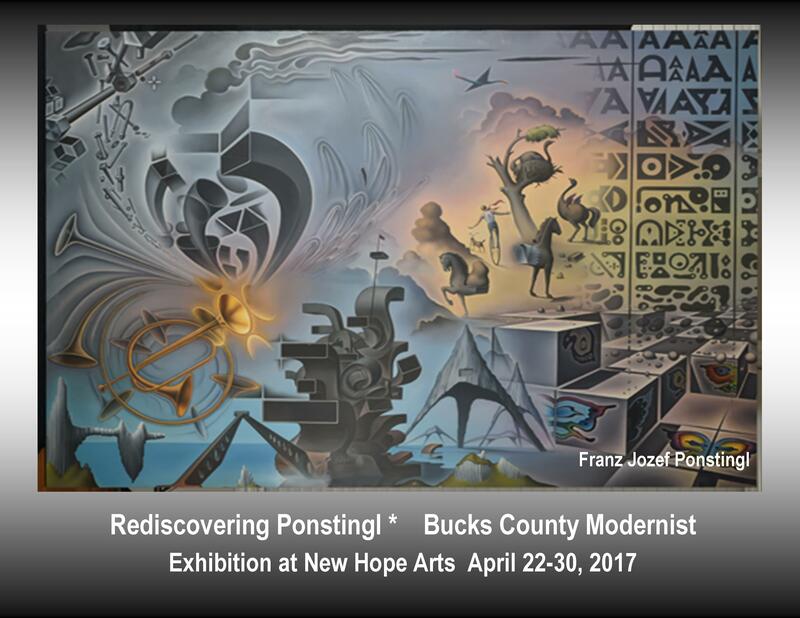 Rediscovering Ponstingl, an exhibition of more than 20 works by a Bucks County artist who was virtually forgotten until recently, is showcased at New Hope Arts from April 22 to 30. Franz Jozef Ponstingl (1927-2004) grew up and frequently returned to the Bucks County farm which was his home. He was also self- taught craftsman, world traveler, outsider artist and original talent chronicled for the first time in an exhibition of work at The Baum School of Art in Allentown, PA in 2016. The resurgence of interest in his work also featured Ponstingl’s inclusion in the James A. Michener Art Museum ‘s The Death of Impressionism? Dissruption and Innovation in Art which closed in February 2017. New Hope Art’s Rediscovering Ponstingl marks a first solo exhibition of work, representing the talent of original painting present here in the 1960s and 70s. Ponstingl is among the working artists not acknowledged by popular conceptions of Bucks County landscape painting – and now being rediscovered and appreciated.